Coming up with the funds to buy your first home is tough. It’s often noted as the number one obstacle for first-time homebuyers. Most people save a few years for the down payment and everything you will need to furnish the home. With rates on the rise and prices climbing, you might feel the need to speed up the process. That’s OK as long as you do not make this major mistake with your retirement account. If you listen to some advisors, they will present this opportunity to you like it is a gift from heaven without telling you the potential downsides. 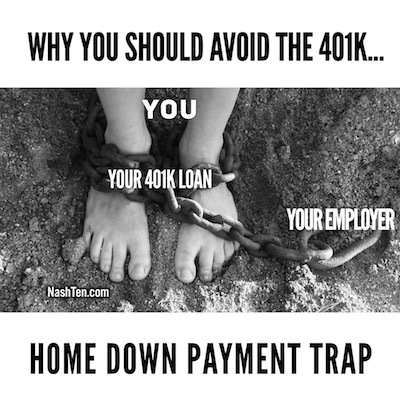 First, the money you take out of your 401K for a downpayment is a loan and not a gift to yourself. You will have to pay back this loan to your 401K with interest. What’s weirder than paying yourself interest? Second, borrowing from your 401K could prevent you from making the full contribution to your retirement account going forward. This could result in not getting the full match in contribution from your employer. Who wants to leave money from your employer on the table? Last, if you are laid off or quit for any reason, the loan is due in full within 60 days. If you can’t pay it off on time, you will be charged a 10% tax on the balance. Do you want to be shackled to your employer if a better job offer comes along? This is too much risk to take when there are safer ways to accomplish the same task. If you want to talk about a better way to buy your first home, then hit reply and I’ll get right back to you. And if you are not a first-time homebuyer, feel free to forward this to someone who needs help. The Daily Deal in Nashville is this newly, renovated ranch in Bellevue [West Nashville] that has hardwood flooring, a vaulted family room and is listed for less than $300,000.